Peanut Butter Cream Eggs, the perfect Easter treat! Peanut Butter Cream Eggs, the perfect Easter treat! Peanut Butter Cream Eggs are so easy to make and absolutely delicious! They are the perfect Easter treat to fill those baskets! Hi guys!! I got a super cute recipe to share with you today! These Peanut Butter Cream Eggs are a hit around Easter and you can make them yourself in no time! Now everyone loves the Reeses Easter Eggs and when I was little we would get peanut butter cream filled chocolate eggs with our names on them in chocolate and this recipe came from my love of both of those Easter treats. 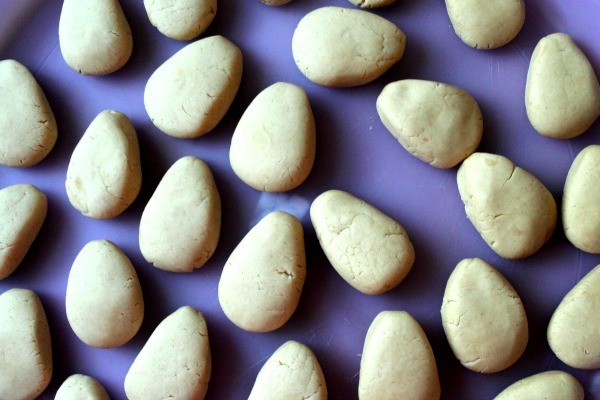 I love this recipe because you can make the eggs as big as you like or as small as like, if you want to make little poppable eggs. This is a very very easy recipe! I promise you can make these!! You will be amazed how easy they are. They are also so fun to decorate. We all love dyeing Easter eggs but these ones you get to decorate with chocolate and sprinkles, yes please!! Just mix together a few ingredients, form the dough into eggs, freeze, dip into chocolate and decorate!! It is literally that simple. You will be pumping out these Peanut Butter Cream Eggs faster than the Easter Bunny! Now the dipping process is so quick you have to put the sprinkles on immediately after you dip one. However, if you want the kids to help decorate you can buy some edible markers (I bought mine here) and let them decorate the eggs anyway they want! Now I dip mine in white chocolate so the decorations stand out more and I like working with white chocolate and it makes for a deliciously creamy peanut butter egg but feel free to dip yours in milk or dark chocolate, then you will get a real peanut butter cup egg taste. 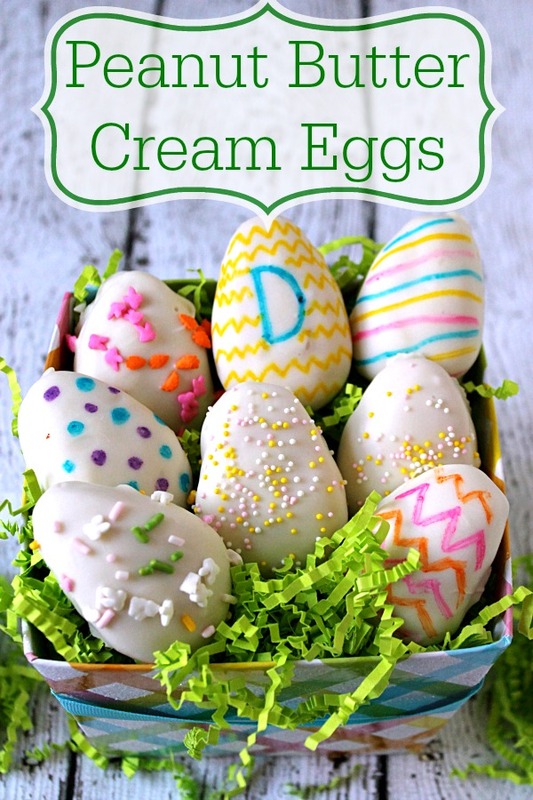 You can even mix it up, use a variety of chocolates, dip them in the colored melts for super colorful eggs. These are delicious and make great gifts and the recipe makes about 3 dozen depending on how big you make yours so that’s a lot of decorating! So grab some peanut butter and get cracking (ha!) on these Peanut Butter Cream Eggs! Do I chill these in the fridge or freezer? I chill them in the freezer because that makes it easier when dipping but you can also chill them in the fridge. Either way just make sure they stay cold while you are dipping the others. Can I melt chocolate chips for dipping? I have never had too much luck melting chocolate chips for dipping. You have to add a shortening or coconut oil to get it to a good dipping consistency. I always just buy the almond bark or candy melts. Is almond bark the same as white chocolate? It is! And I love working with it, it melts so easily and is perfect for dipping. Sure!! I would say you could make these 3 days in advance, maybe longer if you refrigerate them. Depending on how long they will be around for. If you make them the night before and they will be eaten the next day you can leave them unrefrigerated. After that I would keep the leftover in the fridge just because there is butter in the filling. Can I roll these out and cut egg shapes out? You can, the egg shape is pretty easy to hand mold and I like a thicker egg. Hand shaping them also prevents the cream filling from getting to warm by being rolled out and then rerolled. In a large bowl, beat cream cheese, butter, peanut butter and vanilla until smooth. Beat in sugar. Form rounded tablespoonfuls into egg shapes. Place on waxed paper-lined baking sheets. Chill for 30 minutes. In a microwave-safe bowl or heavy saucepan, melt chocolate chips and shortening: stir until smooth. Dip eggs until coated; place on waxed paper to harden. My daughter would get such a kick out of making these eggs… they are beautiful. Thanks for sharing them with us on foodie friday. Perfect for Easter! They look great. these EGGS LOOK PERFECT FOR THE PEANUT BUTTER LOVER FOR Easter!! I may need to try this one! Thanks so much for sharing this at the Friday Frenzy! These are so BEAUTIFUL! I must try them out too!